ARLINGTON, Texas (AP) Bartolo Colon didn’t make history on Saturday for the Texas Rangers, but his teammate Shin-Soo Choo did. 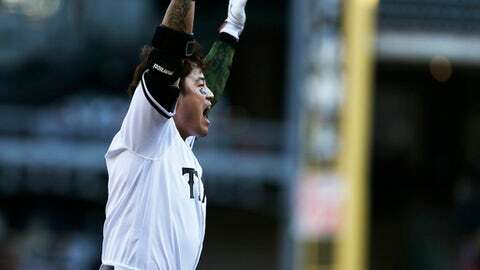 Choo became the top major league home run hitter born in Asia, connecting for a leadoff drive in the 10th inning that lifted the Rangers over the Kansas City Royals 4-3 Saturday. The South Korea native’s 176th career homer moved him past Hideki Matsui for the most by an Asian player. Choo hit a 3-1 pitch from Kevin McCarthy (3-2) the opposite way into the Royals bullpen for his eighth home run this year. It was his third career walk-off homer and first in five seasons with the Rangers. ”With a 3-1 count, I’m just looking for one pitch in one area, and try to swing hard,” Choo said. Alex Claudio (3-2) got the win by working the 10th. Bartolo Colon, pitching two days after his 45th birthday, threw a season-high 102 pitches and gave up five hits in seven innings for Texas. He remained stuck on 242 career wins and will have to wait at least one more start to tie Juan Marichal for most wins by a native of the Dominican Republic. In 97-degree heat, Colon allowed four hits during a three-run third. He gave up just two runners over the other six innings and struck out four. The Royals did their only damage against Colon by getting to him early in counts in the third. After Hunter Dozier beat out an infield single, Alcides Escobar and Jon Jay each singled on the first pitch they saw, scoring one run. Whit Merrifield then hit a 1-0 pitch into the left-field corner for a two-run double. The Rangers tied it with single runs in the third, fourth and sixth. Ronald Guzman, who had homered in his previous four starts, tied it with a two-out double off reliever Brad Keller. Royals starter Ian Kennedy gave up five hits and two runs in five innings and hasn’t won since April 7, a stretch of nine consecutive starts. Joey Gallo had an RBI double and a key stolen base that led to the tying run, but his most impressive feat might have been calling Choo’s walk-off. Royals: LHP Eric Skoglund, who started Friday night, was put on the disabled list with a left elbow sprain. He is likely to have an MRI on Monday. Kansas City called up LHP Eric Stout from Omaha for his second stint with the club this year. … Manager Ned Yost said Lucas Duda would remain on the disabled list, even though he’s eligible to come off, as he battles plantar fasciitis in his right foot. Rangers: SS Elvis Andrus has started swinging a bat as he recovers from a fractured right elbow suffered on April 11. Andrus took dry swings Saturday and hopes to be taking batting practice by the end of next week. … LHP Matt Moore threw another bullpen session Saturday. He is on the disabled list with a sore right knee. Royals: RHP Jason Hammel (1-5, 5.70) takes the mound Sunday in the series finale. Hammel won for the first time in 2018 by holding the Cardinals to one run over seven innings Tuesday. Rangers: LHP Cole Hamels (3-4, 3.38) starts Sunday for Texas. The lefty has won his last two starts, allowing just five hits in 13 innings against the Astros and Yankees.